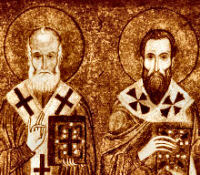 O God, who were pleased to give light to your Church by the example and teaching of the Bishops Saints Basil and Gregory, grant, we pray, that in humility we may learn your truth and practice it faithfully in charity. Through our Lord Jesus Christ, your Son, who lives and reigns with you in the unity of the Holy Spirit, one God, for ever and ever. Today the Church celebrates the memorial of St. 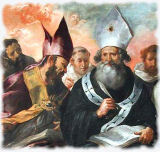 Basil the Great and St. Gregory Nazianzen, bishops and doctors. This is the ninth day of the Christmas season. St. Basil was a brilliant student born of a Christian family in Caesarea, Cappadocia (Turkey). For some years, he followed the monastic way of life. He vigorously fought the Arian heresy. He became Bishop of Caesarea in 370. The monks of the Eastern Church today still follow the monastic rules which he set down. St. Gregory was also from Cappadocia. A friend of Basil, he too followed the monastic way of life for some years. He was ordained priest and in 381 became Bishop of Constantinople. It was during this period when the Arian heresy was at its height. He was called "The Theologian" because of his great learning and talent for oratory. According to the 1962 Missal of St. John XXIII the Extraordinary Form of the Roman Rite St. Basil is celebrated on June 14 and St. Gregory on May 9. Today is the Feast of the Holy Name of Jesus, which is celebrated on January 3 in the Ordinary Form of the Roman Rite. St. Basil was born about 330, the oldest of four sons; three of his brothers became bishops, one of whom was St. Gregory of Nyssa. His pious grandmother Macrina exercised a great influence upon his religious education: "Never shall I forget the deep impression that the words and example of this venerable woman made upon my soul." Between St. Basil and St. Gregory of Nazianzen an intimate friendship existed from youth to old age. Of Western monasticism St. Benedict was the father and founder, of Eastern monasticism, St. Basil. As bishop, Basil was a courageous and heroic champion of the Catholic faith against the Arian heresy. In 372 Emperor Valens sent Modestus, the prefect, to Cappadocia to introduce Arianism as the state religion. Modestus approached the holy bishop, upbraided him for his teaching, and threatened despoliation, exile, martyrdom, and death. To these words of the Byzantine despot, Basil replied with the peace of divine faith: "Is that all? Nothing of what you mentioned touches me. We possess nothing, we can be robbed of nothing. Exile will be impossible, since everywhere on God's earth I am at home. Torments cannot afflict me, for I have no body. And death is welcome, for it will bring me more quickly to God. To a great extent I am already dead; for a long time I have been hastening to the grave." Astonished, the prefect remarked: "Till today no one has ever spoken to me so courageously." "Perhaps," rejoined Basil, "you have never before met a bishop." Modestus hastened back to Valens. "Emperor," he said, "we are bested by this leader of the Church. He is too strong for threats, too firm for words, too clever for persuasion." Basil was a strong character, a burning lamp during his time. But as the fire from this lamp illumined and warmed the world, it consumed itself; as the saint's spiritual stature grew, his body wasted away, and at the early age of forty-nine his appearance was that of an old man. In every phase of ecclesiastical activity he showed superior talent and zeal. He was a great theologian, a powerful preacher, a gifted writer, the author of two rules for monastic life, a reformer of the Oriental liturgy. He died in 379, hardly forty-nine years old, yet so emaciated that only skin and bones remained, as though he had stayed alive in soul alone. Patron: Cappadocia; hospital administrators; reformers; Russia. Symbols: Supernatural fire, often with a dove present. Gregory, surnamed the "Theologian" by the Greeks, was born at Nazianz in Cappadocia in 339. He was one of the "Three Lights of the Church from Cappadocia." To his mother, St. Nonna, is due the foundation for his saintly life as an adult. He was educated at the most famous schools of his time - Caesarea, Alexandria, Athens. At Athens he formed that storied bond of friendship with St. Basil which was still flaming with all the fervor of youthful enthusiasm when he delivered the funeral oration at the grave of his friend in 381. Gregory was baptized in 360, and for a while lived the quiet life of a hermit. In 372 he was consecrated bishop by St. Basil. At the urgent wish of Gregory, his father and bishop of Nazianz, he assisted him in the care of souls. In 381 he accepted the see of Constantinople, but grieved by the constant controversies retired again to the quiet life he cherished so highly and dedicated himself entirely to contemplation.